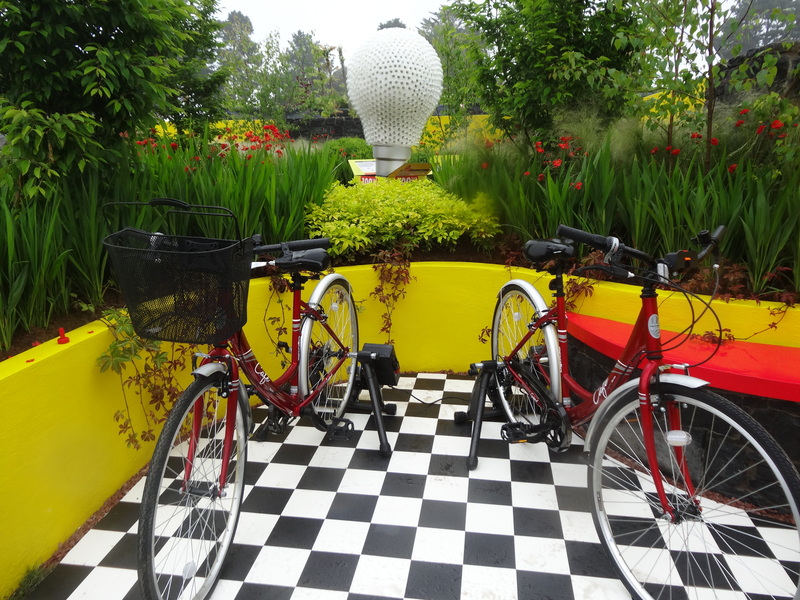 Irish garden design showcased – Bloom 2014. ← Postcards from the edge. 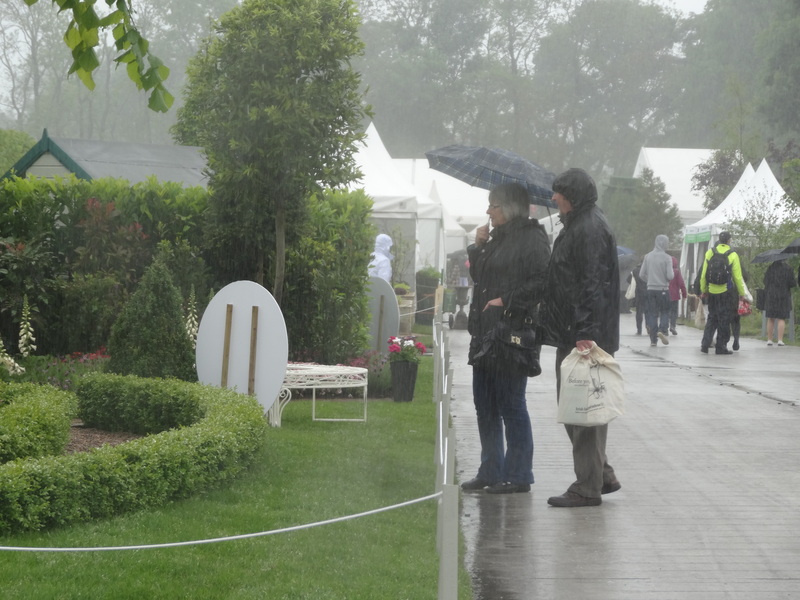 Bloom 2014.
but there was plenty of sunshine awaiting us on Day 1 at Bloom in the Park 2014, Dublin’s annual garden festival. 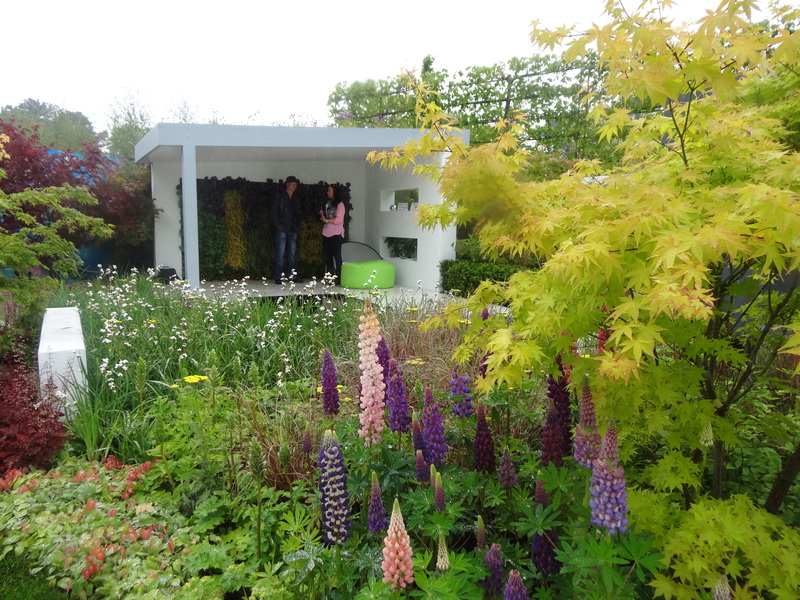 The Show Gardens were varied, both in content and delivery, but many were manned by enthusiastic designers keen to explain the ideas behind their creations. 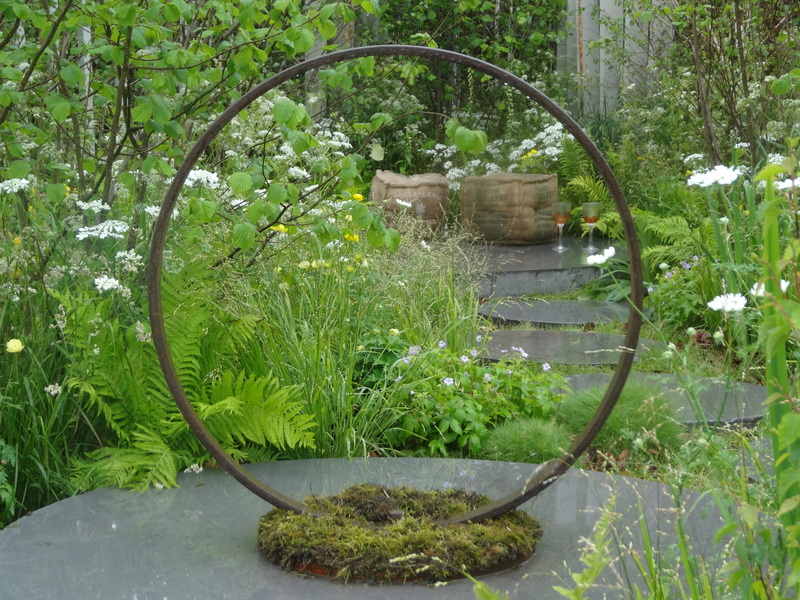 … a “quiet spot in a busy place” was how Deirdre described it – notice the repetition of the circle motif creating harmony. 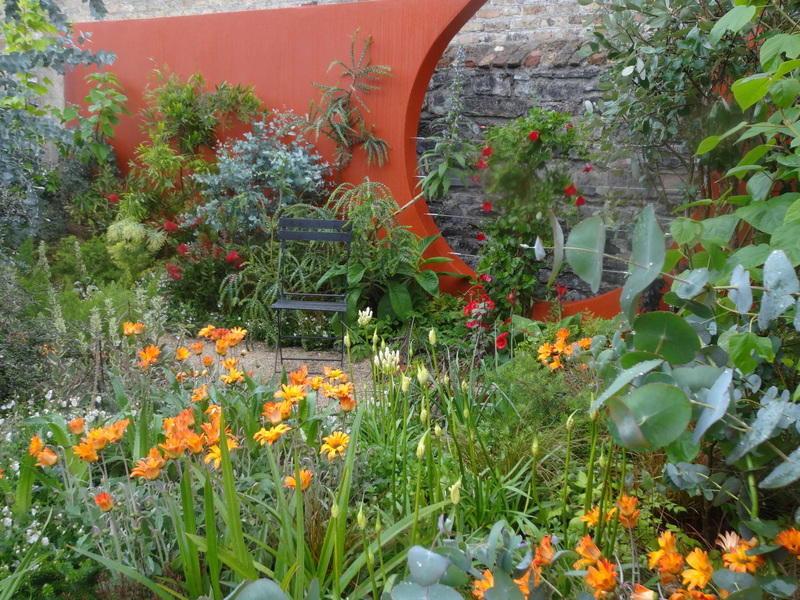 This year Limerick is celebrating its status as City of Culture and Ailish Drake’s lovely Limerick Culture Garden was an interpretation of Limerick’s medieval past. Medieval monastic gardens were enclosed, contemplative environments, the Hortus conclusus, geometrically shaped and growing fruit, vegetables and medicinal herbs. 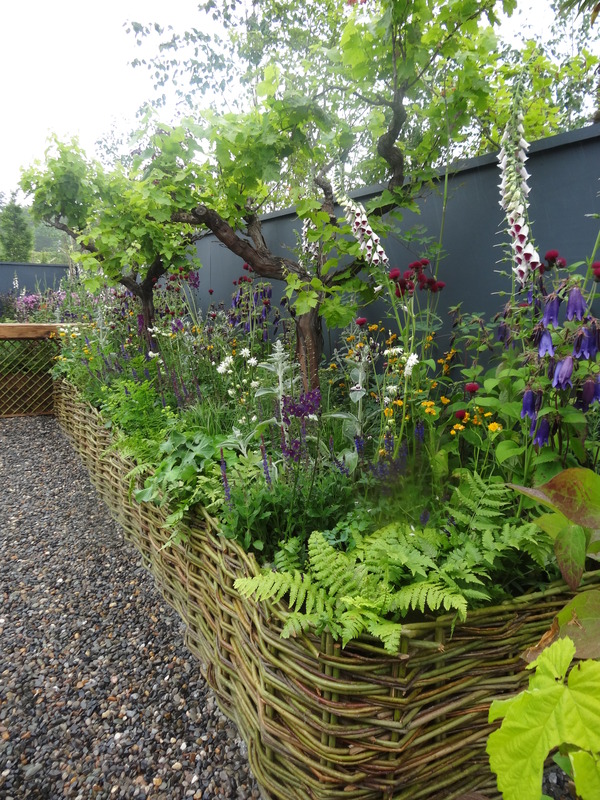 This was a much more structured garden than Deirdre Pender’s one but I felt it ,too, conveyed that intangible peaceful quality – the wattle beds brimming with plants, grapevines and bees. 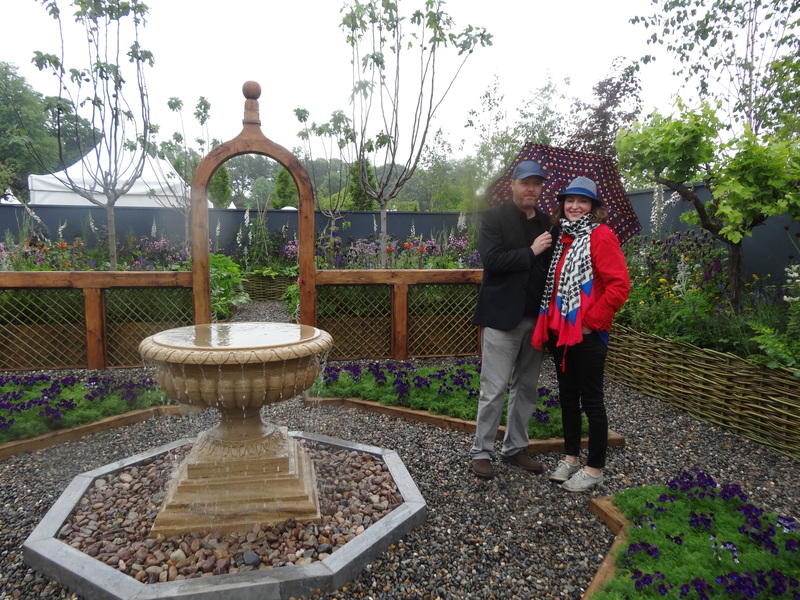 Regular readers will know what a fan I am of pleached trees and a garden designed by Anthony Ryan for Our Lady’s Children’s Hospital, Crumlin, with Kildare Growers had immaculate planting, as one descended into the refuge or bolt-hole. 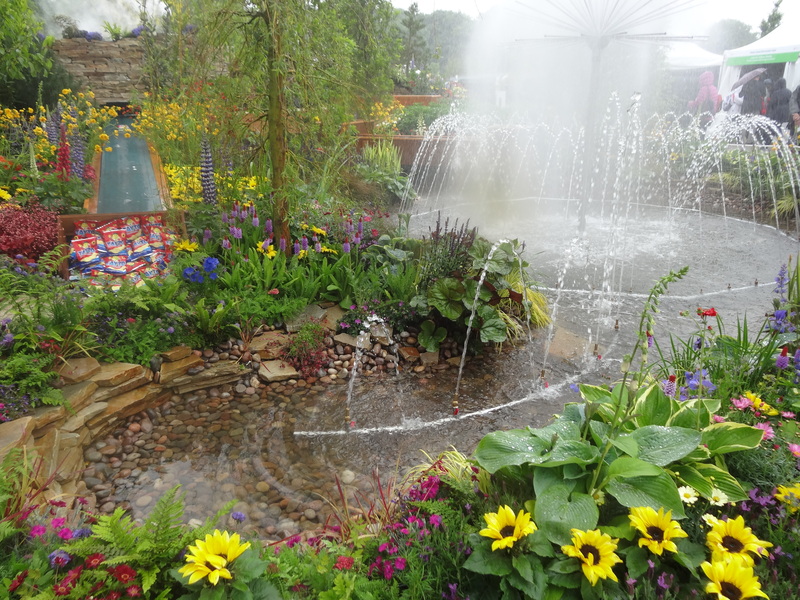 The cost of constructing these gardens runs into many thousands and could not exist without strong sponsorship, so the designers are sometimes constrained, but often inspired, by the input of their sponsor. A perfect fit was found by the Samaritans and their designer Andrew Christopher Dunne. 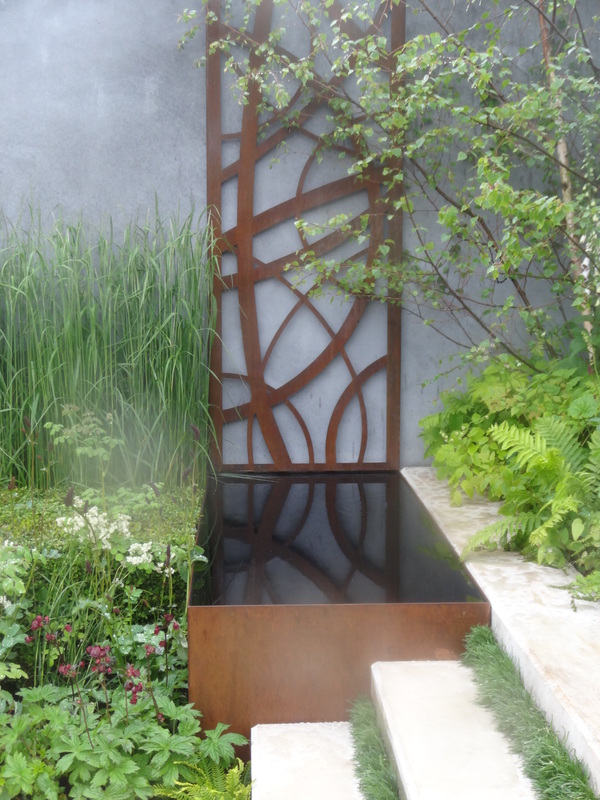 Their garden “You Talk, I’ll Listen” was one which had many perfect details, stone terraces and reflective steel pools. As I wandered through the garden with Andrew, I was constantly impressed by how he had fulfilled the brief. The specially commissioned wall plaques conveyed the troubled mind, yet the reflective quality of the deep, dark pools stilled that troubled mind. whilst the cradle seat offered sanctuary .. the sounds of the Show barely audible after we descended into the garden. 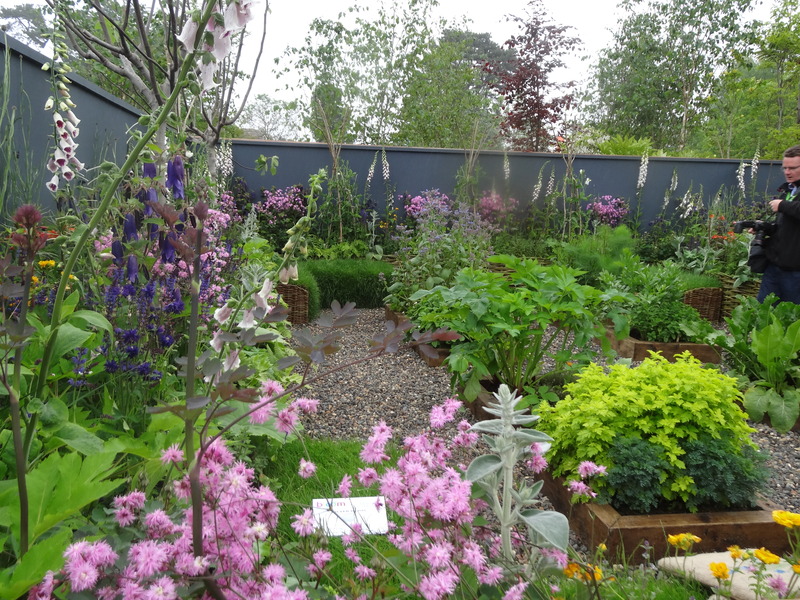 I loved it, and so did the judges, winning it the Best in Category award for a medium garden. 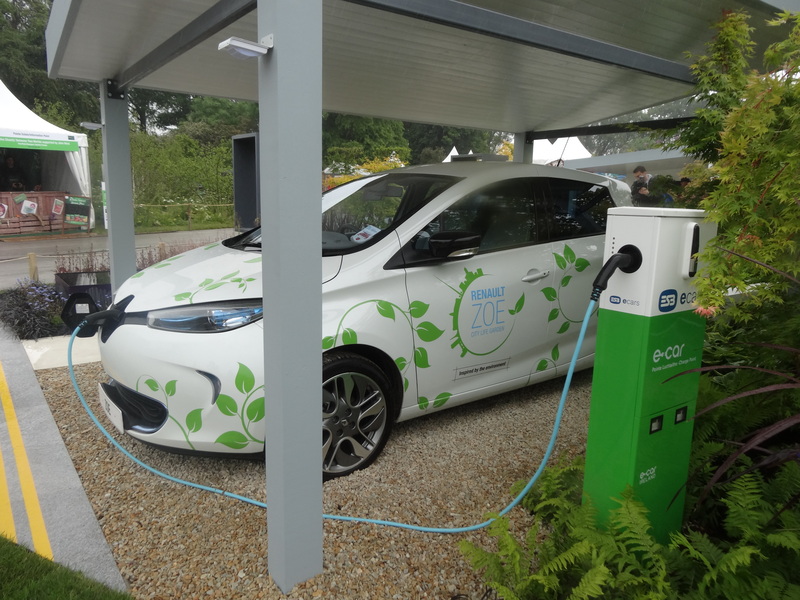 with a green roof, living wall and an electric car to seal its green credentials. 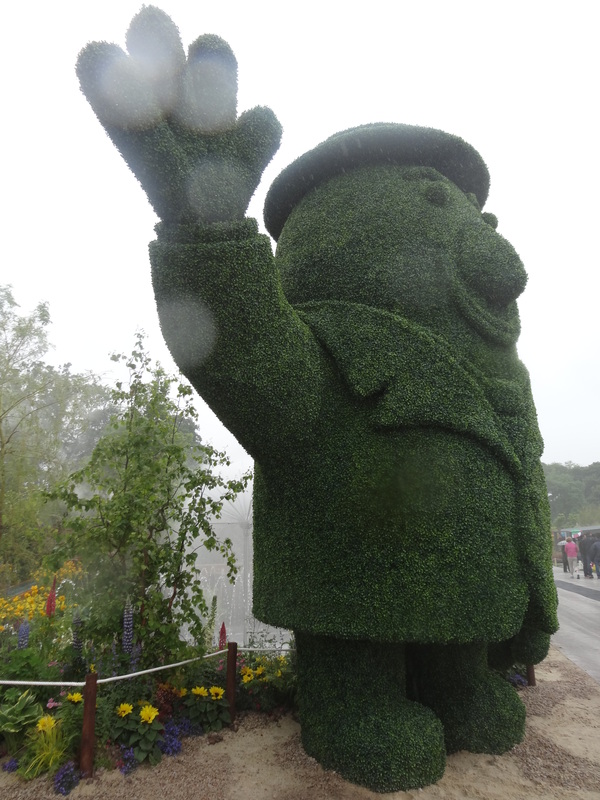 Last year, I mentioned how much I liked Ocean Spray’s Cranberry garden – here. 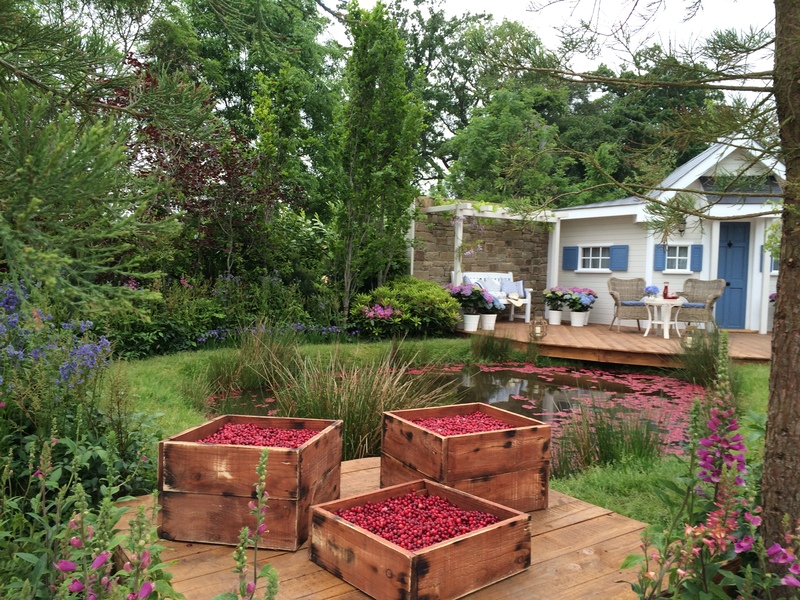 This year, they struck Gold with a pretty Wellbeing Wetlands Garden, designed by Alan Rudden and David Ryan which sought to convey a cranberry farm setting with large bog wetland pond in the centre. 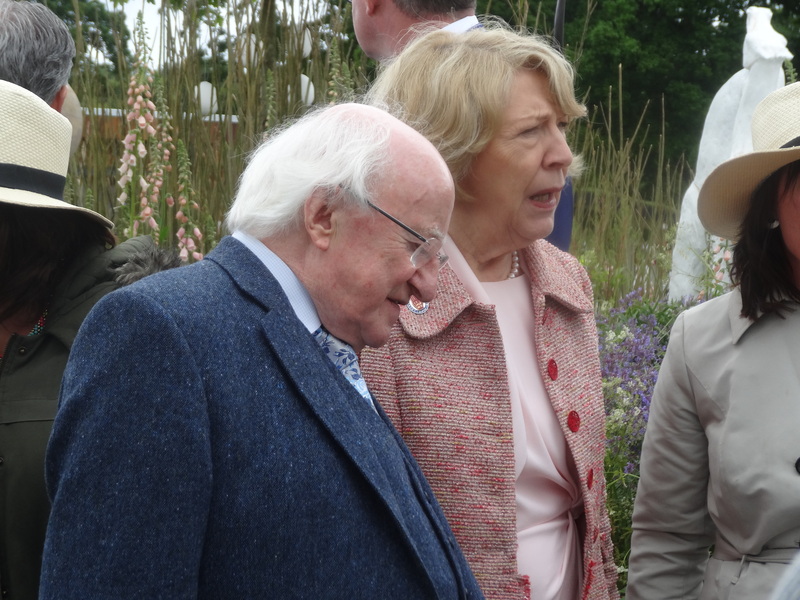 Happily the rain eased off by mid-day and the President of Ireland, Michael D Higgins and his wife popped in from the Presidential House, Áras an Uachtaráin, (across the road), to offer support to the designers. 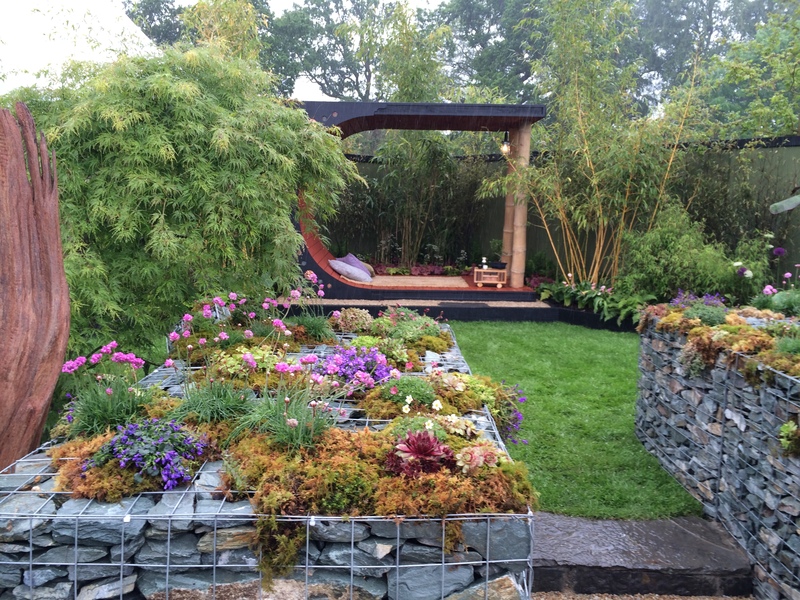 Congratulations to all the designers – the road to Bloom, or any Garden Show, is a stressful and arduous one. Now let’s hope lots of commissions will ensue. 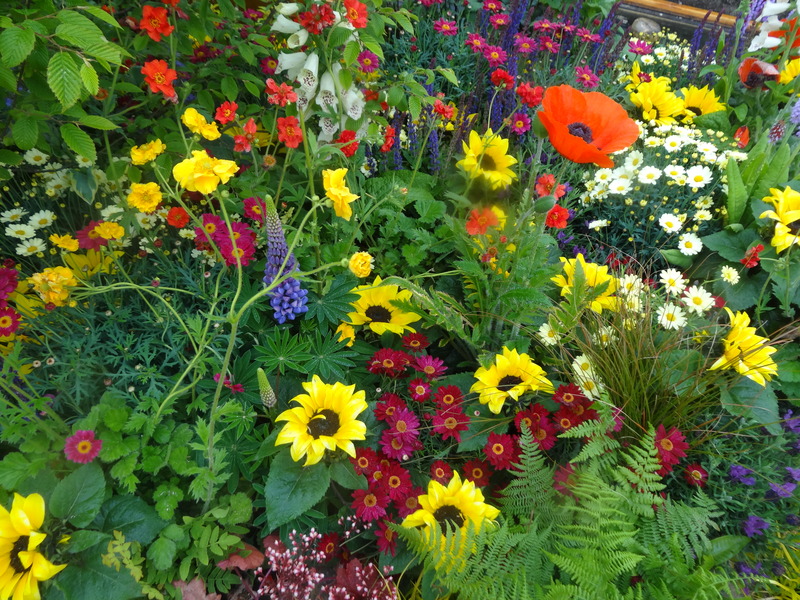 You can read about what was achieved in the tiny “Postcard Gardens” here. 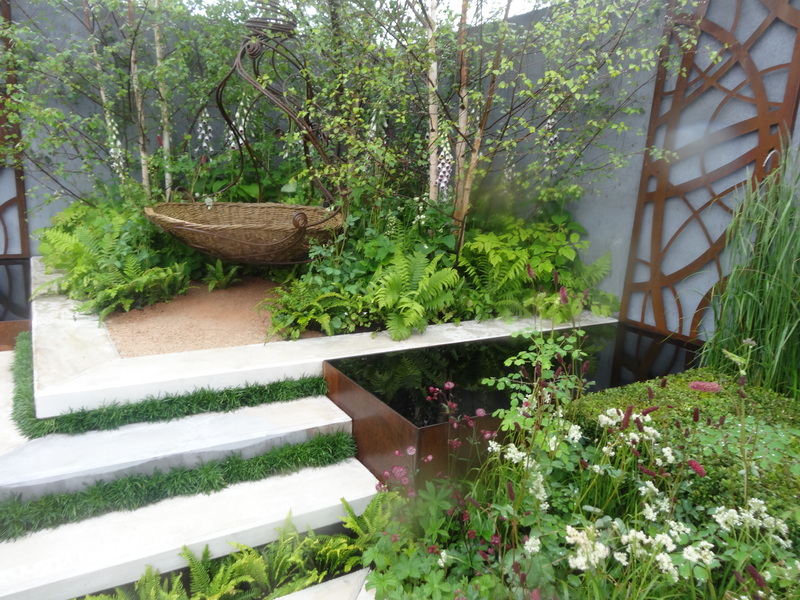 *Latest news* An hour after I wrote this, it was announced that Andrew won the coveted Designers’ Favourite Award, for his “You talk I’ll listen” garden. Delighted for him! 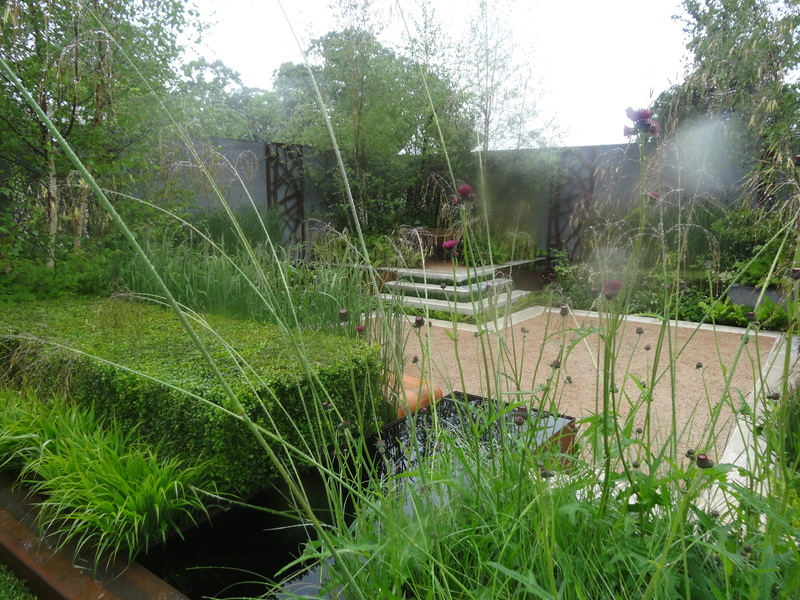 I also liked those 2 gardens, both very tranquil, which I like. Always a joy to view your pictures. Rainy or knot – good work! Mother Nature at her best. 🙂 Happy Sunday to you! Your second shot now adorns my desktop. Hope you don’t mind. 🙂 It so brightens my mood. Delighted that you are using it – enjoy! Many thanks indeed for your very nice comments too! 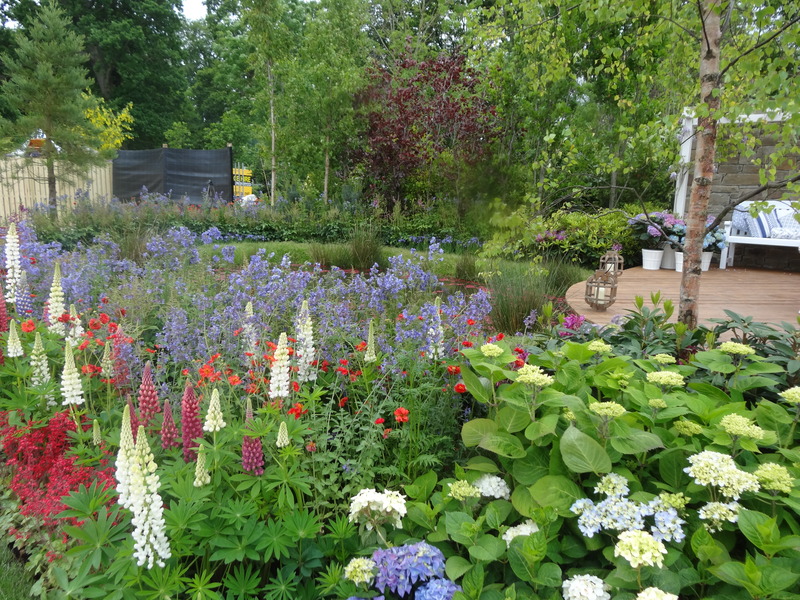 Lovely to see all these gardens. I love the Celtic one and I really enjoyed seeing so many Lupins. I think you did brilliantly with the photography on such a wet day. Little globules of moisture on the camera lens! 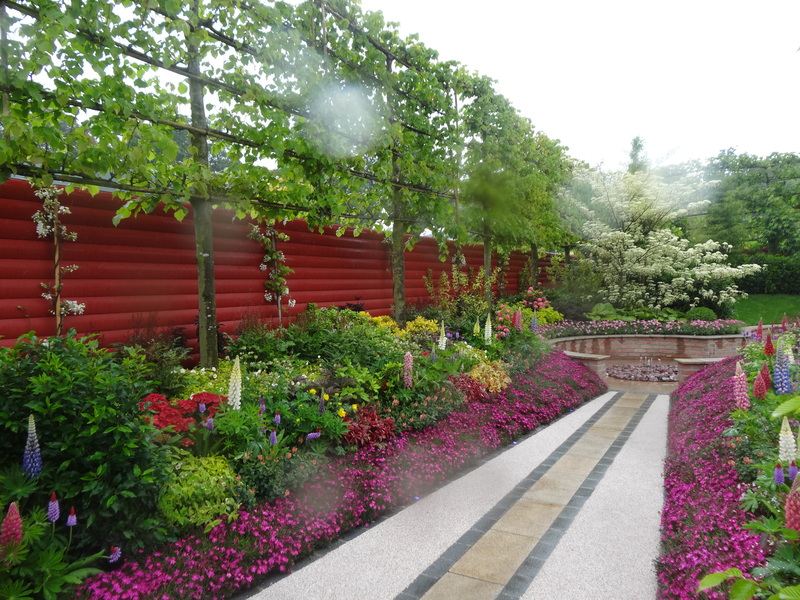 The Celtic garden was just what an Irish garden should be – natural, green, lyrical! 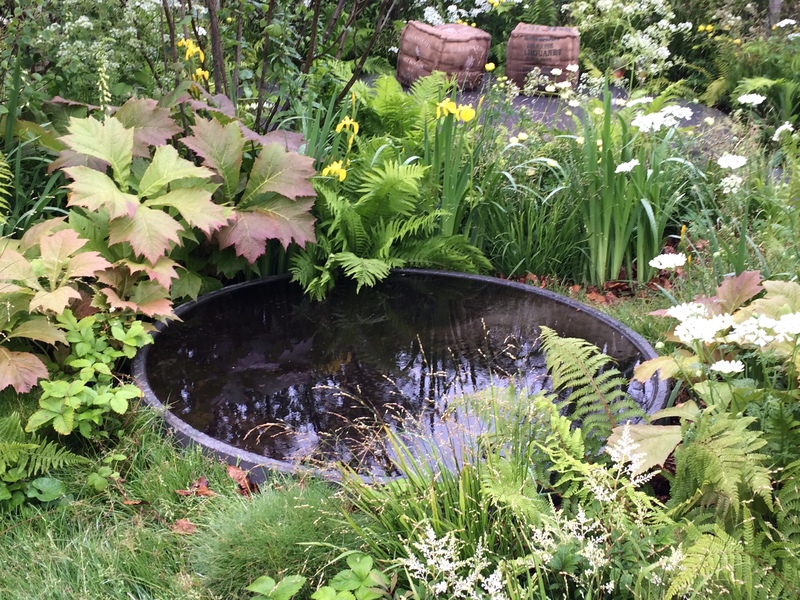 The pond was made of precast concrete – a recycled object I think. It’s late now, but another time, I would love to know how that lovely circular pond was made. I am just altering part of my garden and it has just so happened that two circles have come together, almost like a figure 8. It feels very satisfying to look at. Thank you for sharing the photos and giving us a tour of this special event. I really enjoyed it. It is inspiring. Many thanks – glad you popped by and enjoyed it! I agree .. I always come away with new ideas .. Many thanks Cynthia – I agree!